- Cream with Thai chili oil and green tea. The cream contains an extract from several types of Thai pepper, due to which, it has a thermal effect and promotes the splitting of fat, improving the appearance of the skin by reducing cellulite and the effect of "orange peel". Mineral oil with vitamin E and green tea extract soften and smooth the skin, making it more elastic throughout the process of losing weight, prevent the appearance of stretch marks. - Cream with ginger and sunflower oil. Ginger has warming and local irritating effects, enhances microcirculation and supply of cellulite-damaged tissues, improving their nutrition and normalizing metabolic processes. It is also a wonderful antioxidant that rejuvenates the skin, making it smooth and supple, removes toxins, slag and excess fluid, heals the damage. 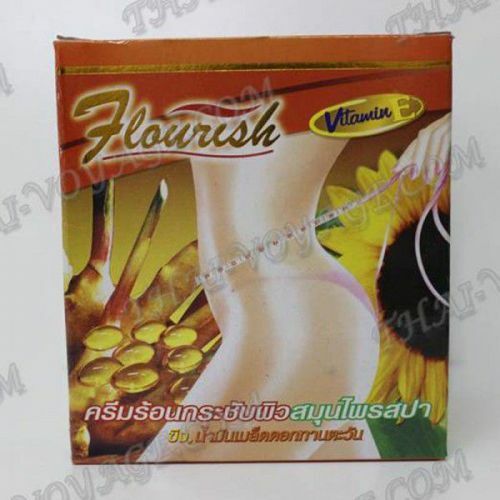 Sunflower seed oil is rich in fatty acids, essential for the beauty of the skin, and vitamin E - tocopherol is especially good in combating cellulite, dryness and flabbiness. Being a strong antioxidant, it accelerates the process of producing collagen, elastin and hyaluronic acid, perfectly softens, soothes and moisturizes, eliminates flaking, pigmentation spots, rash. The composition of the cream for greater effectiveness included an additional dose of vitamin E.
- Cream with ginseng and coffee. Coffee beans actively affecting the receptors of subcutaneous fat cells help to improve circulation, smoothing and leveling the skin, while stimulating the burning of fats in problem areas, maintain the elasticity of the skin, make the skin more elastic. Caffeine, which is in the cream, eliminates the causes of fluid stagnation, actively counteracts new deposits of subcutaneous fat, speeds up the metabolic processes in the subcutaneous fat cells, softens the hardened areas of fat deposits. Anti-cellulite and firming cream Flouresh for thighs and buttocks is a wonderful tool for getting rid of fat excess, skin care for thighs and moisturizing. The cream stimulates the regeneration of cells, easily removing the top layer of dead and keratinized skin cells. Cream Flouresh simply "burns" cellulite of the first, second and third degree. The greatest effect and speed are observed in combination with a sauna or exercise. When exposed to water, there is no skin irritation. After washing off the remains of the cream from the body, the soaked cream continues its active burning action for some time. Application: apply a small amount of cream to cleansed skin, in the area of ​​problem areas. Massaging movements rub the cream into the skin until completely absorbed. Use twice a day in the morning and in the evening. For quick results, it is recommended to combine with healthy nutrition, massage, sauna and sports exercises. Anti-cellulite cream is recommended not to be used more than twice a week, the effect is noticeable after the second application. Attention! It is recommended to conduct an allergy test. Do not use if there are open wounds, deep scratches, near intimate areas and on irritated skin. Avoid contact with eyes and mucous membranes. After application, wash hands thoroughly.